Biblical advice about looking up is good guidance today, from seeing the high hanging architectural fruits of old and distressed downtowns, to searching for signs The Great Recession will soon be over. Alas, looking up at ceilings of homes built after World War II has few rewards, because often nothing is there, not even a hint of color, because they are slathered with “ceiling white.” That’s why the most neglected surface of today’s interior decoration is the ceiling. However, this wasn’t always the case—Victorian-era houses often had highly ornamental ceilings, and many upscale older houses could benefit from adding traditional medallions. Should you decide to be a crusader for America’s most neglected interior surface, some suggestions about integrating the colors of Victorian ceiling medallions with other wall colors will help you revive a grand tradition of Victorian interior decoration. The ceilings of Gothic churches, cloisters, and cathedrals were without an attic and revealed the wood or stone structure of the roof, often further decorated at its juncture points by ceiling bosses—projecting ornaments applied at the intersection of ribs, beams, groins, and the like that were generally carved with intricate details. A stone boss, especially in a cross-vaulted ceiling, was a structural keystone, while a wood boss was applied. A popular decorative option was treating them as a heraldic device, appropriately polychromed. Medallions are rooted in these structures. Ceiling medallions are decorative features attached to a ceiling, suspended from the floor joists of the space above. Their geometric shapes of circle, oval, rectangle, or square appeared at the juncture points of a robust carved wood framework for the artworks of Renaissance, Baroque, and Rococo decorated ceilings. Their colors were linked to the framework. 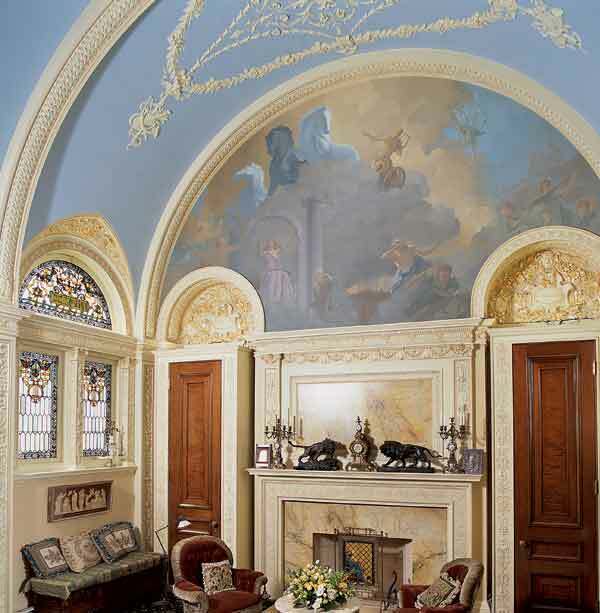 On neoclassical ceilings, cast plaster medallions were juncture points of an elegant applied pattern that was a self-sufficient work of art, especially when delicately painted with Wedgwood colors. Victorian ceiling medallions of cast plaster were commonly isolated at the center of a ceiling, often above a lighting device attached to a ceiling joist. To add a decorative medallion, look to the past for inspiration. 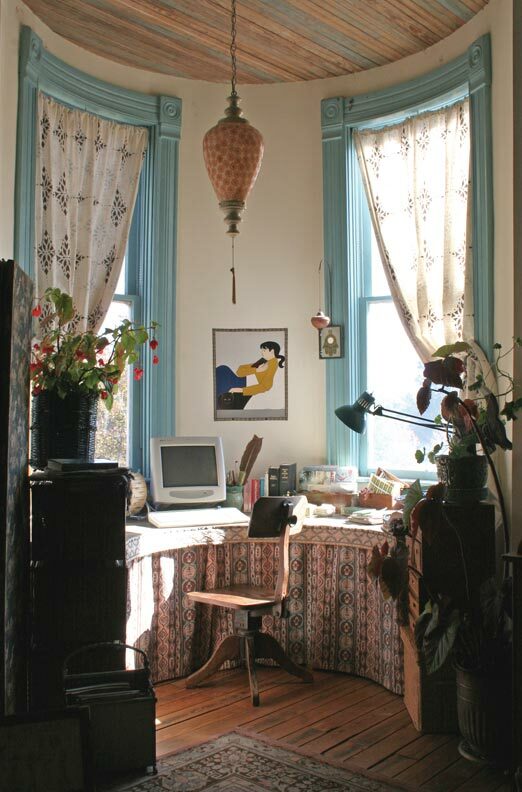 And in Victorian rooms, the color combinations are a key component in harmonizing spaces. Since the 1920s it has been fashionable to ridicule stiff-necked Victorians for their obsession with etiquette, which made Hill’s Manual of Social and Business Forms of 1870 a best-seller with a half-million copies in print by 1900. Formal relationships were the glue that affected everything, including architecture and interior design. Cast-iron filigree on roof ridges softened and made civil the points at which buildings met the sky. Victorians knew their cornice brackets had no structural value; they were polite introductions between the sharp angles of walls, cornices, and columns. Avoiding disharmony of sharp angles and edges also ruled the ceilings of Victorian interiors. Victorians imposed order on their interiors, seeing them as a complete story with a beginning (floor), middle (walls), and ending (ceiling). They were boxes with a bottom, sides, and top, all united by colors and patterns. Bad design was imbalance, disharmony, something missing. Don’t be put off by visual matters named “scale” and “proportion”; they simply refer to concerns about relationships. Goldilocks was good about relationships. Not too large, not too small…“just right.” For example, chandeliers (with or without ceiling medallions) often are hung too high. Apply the Goldilocks principal, and ditto its size when located over a dining table. Ceiling medallions are centrally located at what appears to be the weakest part of the ceiling. Adding one will suggest the ceiling has been strengthened at that point, especially when a pendant lighting fixture implies its weight is pulling the ceiling down. 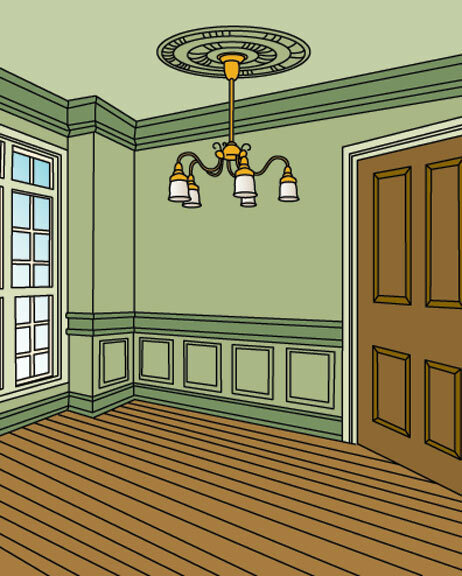 Use this computation to help get sizes right: Measure the ceiling’s shorter dimension, convert it to inches, and divide by one-seventh. This is the starting diameter for your ceiling medallion. A small medallion will measure less than 15" across; medium, 16" to 31"; large, 32" and up. 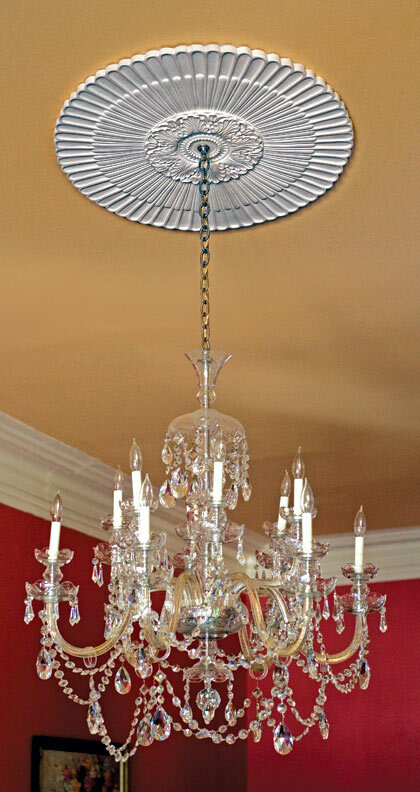 It is tempting to attach a ceiling medallion and call it quits, but the fun has just begun. If it is worth doing at all, it merits the effort to avoid leaving it isolated, like a decorative plaster dressing applied to a wound in the ceiling. Color is the key to success. Americans are not afraid of colors—a visit to a country club pro shop proves the popularity of both colors and patterns. However, Americans are troubled by color contrasts. That’s why I selected a monochromatic interior color scheme (left). 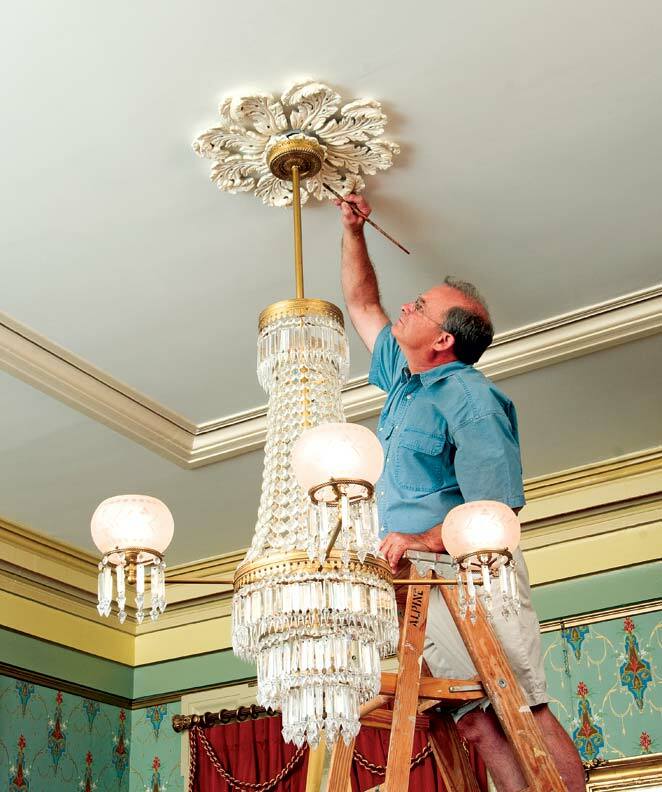 Applying any positive color to a ceiling medallion requires a sympathetic response in the field of the ceiling surrounding it. There’s no rule that the ceiling color must be a lighter tint of the wall color, but that’s a common and comfortable choice. Nor is there a rule that trim color must be applied to both the horizontal trim (cornices, chair rails, baseboards) and vertical trim (windows and doors). My sample color palette uses a mid-tone color for the walls, a darker one for horizontal trim, a tint of wall color for the ceiling, and a pale tint of the ceiling color for the vertical trim. This provides four options for a medallion: a pale vertical trim color or the mid-tone wall color for the medallion on a field of the ceiling color; using the ceiling color for the medallion on a field of the vertical trim color; or heightening the medallion relief by painting its deep and flat background the dark horizontal trim color. The boldest relief of a ceiling medallion will also be its highest. Reflections from careful touches of gloss gold or silver highlights will attract the eye to these finest features. Gold and silver are neutral colors that work well with all colors, but gold tends to work best on warm colors and silver on cool ones. Both draw the eye up to the medallion, making it sparkle and dance in evening light. Restoring and decorating circular spaces requires making the most of what you've got—and having a few tricks up your sleeve. 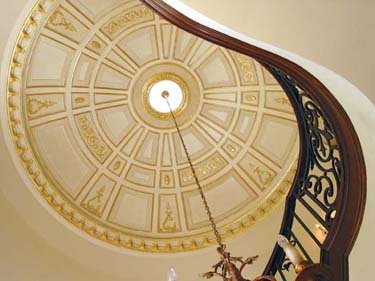 Classic decorative ceilings are typically embellished with color, striping, cast plaster ornaments, corner fans, borders, specialty papers, or murals.